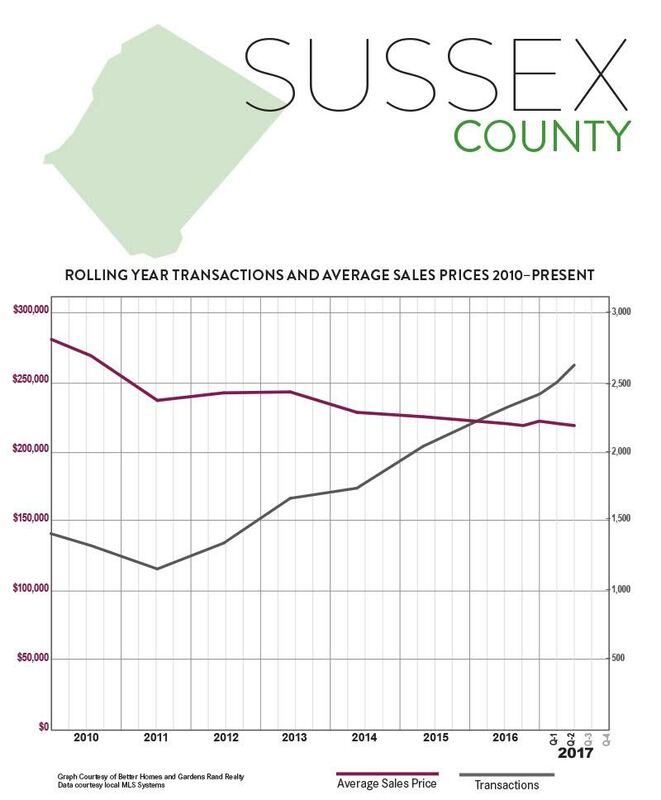 Activity in the Sussex County housing market surged yet again in the second quarter of 2017, with sales up sharply even while prices continued to soften. Sales. Sussex sales were up yet again in the second quarter, rising over 25% from last year. And for the year, sales increased over 20%, with over 2,600 home sales representing the highest 12-month total in over 10 years. Indeed, Sussex sales are now up almost 125% from the bottom of the market in 2011. Prices. Prices in Sussex have been bouncing around for the last year. The average was up 8% in the fourth quarter, then down 2% in the first quarter, and now down again by almost 2% in the second quarter. So what’s going on? Most likely, we’re just seeing some noise in the short-term data. If we look at the rolling year, the numbers make more sense, with both the average and the median up about 1%. That’s probably the kind of appreciation we’ll be looking at for the rest of the year. Inventory. The Sussex inventory of available homes for sale fell dramatically again, dropping almost 26% and now down to under 10 months. That’s a significant decline, but inventory is still higher than in other Northern New Jersey counties, which are all approaching the six-month inventory line that usually signals the beginning of a seller’s market. But if inventory continues to go down, we would expect that to put some additional upward pressure on pricing. Negotiability. The negotiability metrics indicated that sellers were gaining some negotiating leverage with buyers . The days-on-market fell again, dropping by 12% (20 days) and now down to under five months of market time. And sellers were retaining a lot more of their asking price, with listing retention jumping three percentage points and now up to almost 97%. Going forward, we expect that Sussex is going to continue to see rising sales coupled with more consistent price appreciation. With an improving economy, homes priced at attractive levels, and near-historically low interest rates, we expect buyer demand coupled with declining inventory to drive a robust Summer market and a strong 2017. To learn more about Better Homes and Gardens Real Estate Rand Realty, visit their website and Facebook page, and make sure to “Like” their page. You can also follow them on Twitter. The Essex County housing market surged again in the second quarter of 2017, with increases in both sales and prices coupled with another drop in available inventory. Sales. Essex sales activity was up again, rising over 13% from the second quarter of last year. For the rolling year, sales are now up over 7%. Indeed, Essex closed over 5,300 units over the rolling year, the largest 12-month total since the height of the last seller’s market over 10 years ago, and up almost 70% from the bottom of the market in 2011. Prices. Essex buyer demand is finally showing signs of an impact on pricing. Compared to the second quarter of last year, the average price was up over 2% and the median was up almost 4%. More importantly, we’re starting to see meaningful long-term price appreciation, with the average up almost 2% for the rolling year. With inventory continuing to fall and buyer demand relatively strong, we would expect prices to gain some momentum in the Summer. Inventory. Essex inventory fell again, dropping over 24% from last year’s second quarter and now down to just about six months. We measure “months of inventory” by calculating the number of months it would take to sell all the available homes at the current rate of absorption, and generally consider anything below six months to signal a seller’s market that would normally drive prices up. Negotiability. The negotiability indicators – the amount of time sold homes were on the market, and the rate at which sellers were able to retain their full asking price – suggested that sellers might be gaining significant negotiating leverage. Most notably, the listing retention rate crossed the 100% threshold for the first time in memory, rising over two percentage points to 101.8%. That’s remarkable. Similarly, the days-on-market fell by two weeks, and is now down to under four months of market time. Those are both positive signals of potential future appreciation. 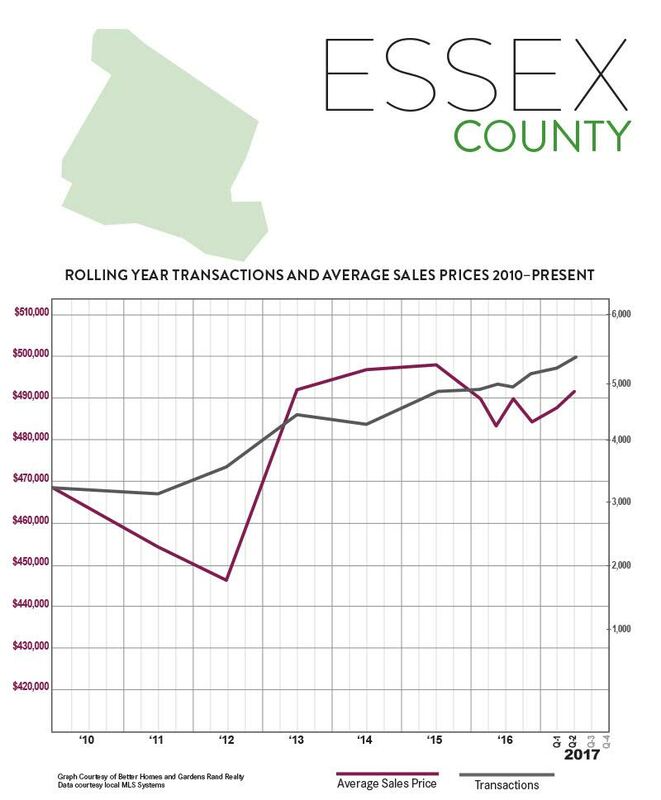 Going forward, we expect that Essex County’s sales activity will continue to have a meaningful impact on pricing. With homes still at historically affordable prices, interest rates low, and a generally improving economy, we believe that low inventory levels coupled with stable buyer demand will drive modest but meaningful price appreciation through a robust Summer market and the rest of 2017. Prices in the Morris County housing market showed meaningful signs of appreciation in the second quarter of 2017, even while low levels of inventory stifled sales growth. Sales. 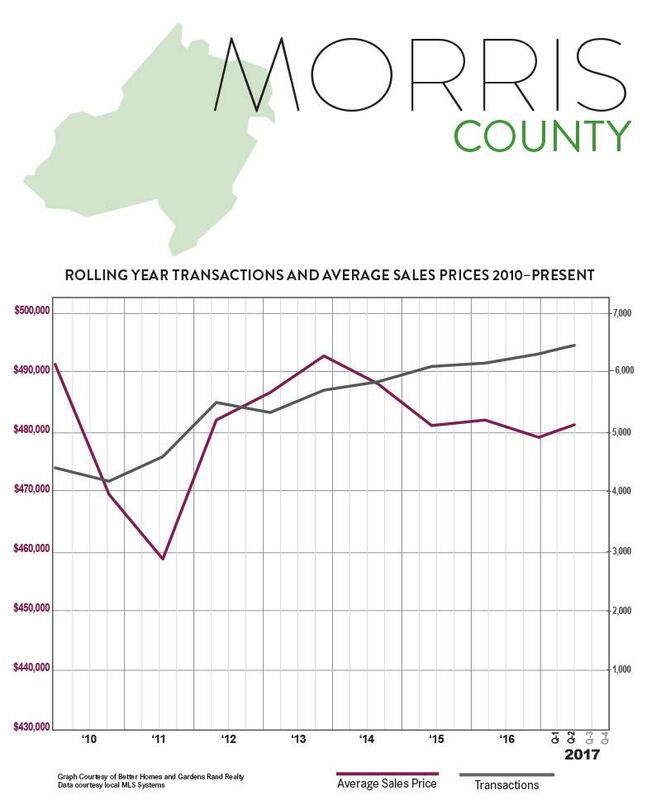 Morris County sales were up slightly, rising over 3% from the second quarter of last year. This continued a streak in which year-on-year sales have now gone up for 11 straight quarters, almost three years of sustained buyer demand. For the year, sales were up over 6%, and are now up over 60% from the bottom of the market in 2011. Prices. These sustained levels of buyer demand are finally having some modest impact on pricing. Continuing a trend we saw in the first quarter, prices were up, this time by about 3% on average and at the median. For the year, prices are up slightly, demonstrating that we might be seeing the first meaningful and lasting Morris price appreciation in years. We believe that sustained buyer demand coupled with falling inventory is likely to drive pricing up through the rest of the year. Inventory. Morris inventory fell again, dropping almost 31% from last year’s second quarter and now down to just over six months’ worth of inventory. We measure “months of inventory” by calculating the number of months it would take to sell all the available homes at the current rate of absorption, and generally consider anything below six months to signal a seller’s market that would normally drive prices up. So the fact that Morris inventory is now close to that six-month mark indicates that we could be in for some meaningful price appreciation throughout 2017. Negotiability. The negotiability indicators showed that sellers are starting to gain negotiating leverage with buyers. The days-on-market indicator was down by 10 days, falling almost 8%, indicating that homes were selling more quickly. And the listing price retention rate continues to rise, now up to just about 98% for the quarter and the year, signaling that sellers are having more success getting buyers to meet their asking prices. Going forward, we expect that Morris County’s sales activity and low levels of inventory will continue to have a meaningful impact on pricing. With homes still at historically affordable prices, interest rates low, and a generally improving economy, we believe that Morris will have a robust Summer market and a strong 2017. The Passaic County housing market rose again in the second quarter of 2017, with sales up and prices continuing to show some signs of meaningful appreciation. Sales. 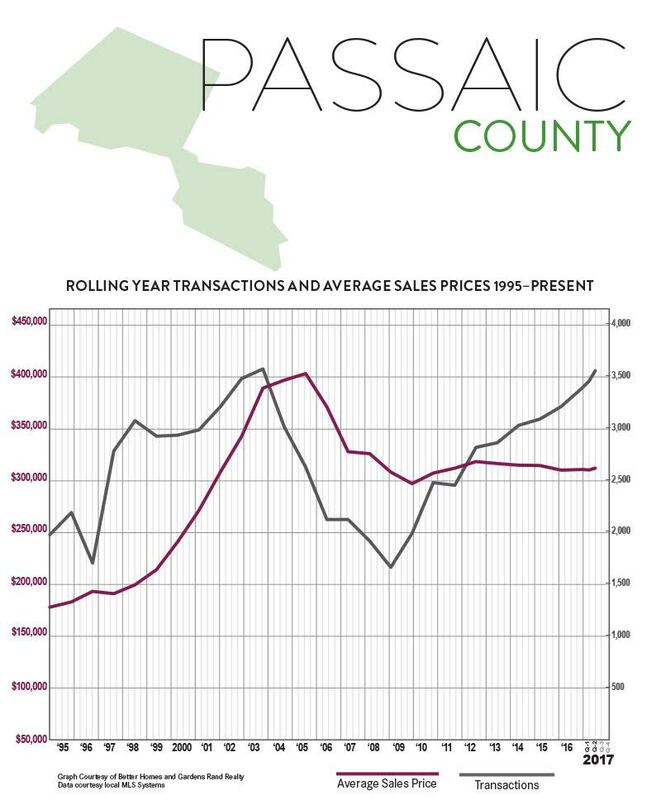 After a dramatic start to the year, Passaic pulled back just a little, but sales were still up over 8% for the quarter and are now up almost 13% for the rolling year. We’ve now seen sustained increases in buyer demand for over five years, with quarterly sales up in 22 out of the last 24 quarters. As a result, Passaic closed over 3,500 homes for the calendar year, the highest total we’ve seen since the height of the last seller’s market ten years ago. Prices. More importantly, we’re starting to see these sustained levels of buyer demand have their first impact on pricing. Prices were up across the board, rising over 1% on average and almost 2% at the median. Prices are still flat or down for the year, due to the lackluster performance in most of 2016, but they seem to be finally heading in a positive direction. With buyer demand strong, and inventory falling, we would expect prices to continue to rise. Inventory. The Passaic inventory of available homes for sale fell again, down over 31% from last year. We measure “months of inventory” by calculating the number of months it would take to sell all the available homes at the current rate of absorption, and generally consider anything below six months to signal a seller’s market that would normally drive prices up. So the fact that Passaic is now down to just over six months of inventory is important, since it presages the possibility of price appreciation for the rest of the year. Negotiability. Sellers continued to gain negotiating leverage, with homes selling more quickly and for closer to the asking price. The days-on-market fell again, dropping over 10% and now down to almost four months on the market. And the listing price retention rate jumped almost two percentage points, and is now up over 98%. Going forward, we believe that Passaic’s fundamentals are sound, with homes priced at relatively attractive levels, rates near historic lows, and a stable economy. Accordingly, we expect these levels of buyer demand, coupled with declining inventory, to continue to drive price appreciation in a robust Summer market and throughout 2017. 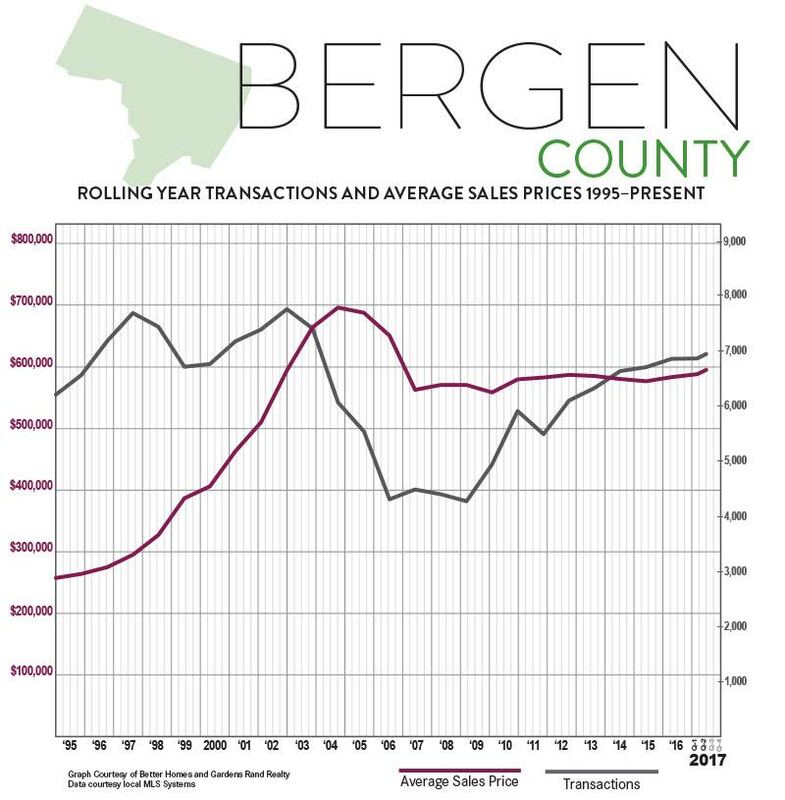 Prices in the Bergen County housing market surged again in the second quarter of 2017, even while low levels of inventory suppressed sales growth. Sales. With inventory continuing to decline, Bergen lacks “fuel for the fire” to satisfy the existing buyer demand. As a result, home sales were relatively flat again, up only about 1% from last year’s second quarter and now up less than 4% for the rolling year. This does, though, mark the 11th straight quarter of year-on-year sales growth. What’s holding sales back right now is not a lack of demand, but a lack of inventory. If we start seeing more homes hit the market, we’ll see sales go up sharply. Prices. Bergen prices spiked again in the second quarter, up 6% on average and almost 5% at the median. That’s probably not a sustainable level of price appreciation, but Bergen homeowners can certainly start to depend on the 3-4% increases that we are seeing on average and at the median for the last rolling year. Negotiability. Inventory continued to tighten in the second quarter, with the months of inventory falling almost 12% and now down to well under six months, which normally marks the beginning of a seller’s market. Similarly, homes are continuing to sell more quickly and for closer to the asking price, which is what we would expect of an emerging seller’s market. The listing retention rate is now almost 97%, and the days-on-market is down to two months. As inventory tightens and the market heats up, we would expect to see sellers continue to gain negotiating leverage. Condos. Activity in the Bergen condo market was up sharply in the second quarter, with sales up over 9% from last year. Prices were more mixed, with the average down a tick but the median up almost 4%. With inventory now down well below six months, though, we would expect to see more meaningful price appreciation this year. Going forward, we expect Bergen County will enjoy a robust Summer market with both rising sales and prices. With inventory tightening, a relatively strong economy, near-historically-low interest rates, and prices still at attractive 2004 levels, we believe that sustained buyer demand will continue to drive meaningful price appreciation through the rest of 2017. 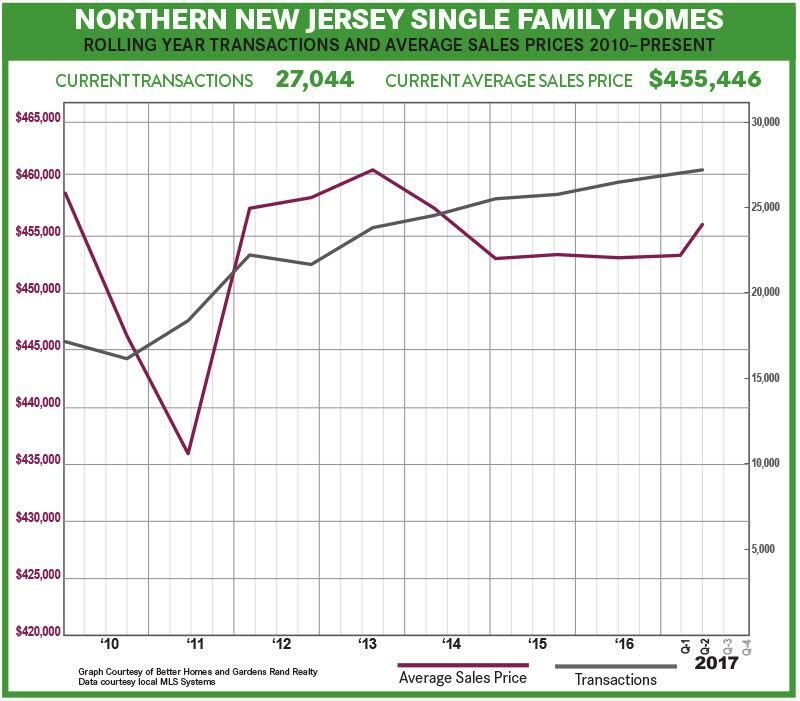 The Northern New Jersey housing market surged again in the second quarter of 2017, with another sharp increase in sales coupled with some more meaningful signs of price appreciation. With inventory levels continuing to fall throughout the region, we expect that sustained buyer demand will drive a robust seller’s market through the Summer and the rest of 2017. Sales surged throughout the region. All the Northern New Jersey markets continued their strong start to the year, with regional sales up almost 8% and transactions rising in every market in the region: up 1% for Bergen houses, 9% for Bergen condos, 8% in Passaic, 3% in Morris, 13% in Essex, and 25% in Sussex. For the rolling year, sales were up almost 8%, reaching sales levels we have not seen since the height of the last seller’s market. Indeed, regional sales are now up over 70% from the bottom of the market in 2011. The number of available homes for sale continues to go down. We calculate the “months of inventory” in a market by measuring the number of homes for sale, and then figuring how long it would take to sell them all given the current absorption rate. The industry considers anything less than six months to be a “tight” inventory that signals the potential of a seller’s market that would drive prices up – and we’re now right at that level. Indeed, inventory was down from last year in every individual county in the Rand Report: Bergen single-family homes down 12%, and condos down 29%; Passaic down 31%; Morris down 31%; Essex down 24%; and Sussex down 26%. If inventory continues to tighten, and demand stays strong, we are likely to see more upward pressure on pricing. With sales up and inventory down, prices are starting to show some “green shoots” of modest price appreciation. Basic economics of supply and demand would tell us that after five years of steadily increasing buyer demand, we would expect to see some meaningful price increases. And we’re starting to see some promising signs: the regional average sales price was up almost 2% from last year’s second quarter, and the average price was up in every county other than Sussex. Looking at the long-term, the rolling year average sales price was up just a tick, but was up in every county other than Passaic. Going forward, we remain confident that rising demand and falling inventory will continue to drive price appreciation through the rest of 2017. Sales have now been increasing for five years, which has brought inventory to the seller’s market threshold in much of the region. The economic fundamentals are all good: homes are priced at 2004 levels (without even adjusting for inflation), interest rates are still near historic lows, and the regional economy is stable. Accordingly, we continue to believe the region is poised for a robust Summer market and a strong 2017. The Dutchess County housing market showed clear signs of an emerging seller’s market in the second quarter of 2017, with the first meaningful signs of price appreciation in years. Sales. Dutchess sales were down a tick for the quarter, probably a reflection of falling inventory in the market. For the rolling year, sales are still up a tick, but Dutchess definitely needs some “fuel for the fire” to accommodate strong buyer demand. Prices. Home prices showed the first signs of life in a long time, with pricing up across the board: rising almost 5% on average, 3% at the median, and over 8% in the price-per-square foot. We can see the same story in the rolling year numbers, indicating that Dutchess is moving into a sustained seller’s market. Negotiability. Dutchess inventory declined sharply in the second quarter, down 51% from last year. This might be partly caused by a change in the way we are measuring Dutchess inventory, so we don’t know that the percentage change is reliable. But the prevailing months of inventory at 7.5 months does support the idea that we’re moving into a seller’s market. Condominiums. The condo market was up sharply after a slow start to the year, with sales up almost 52% from the second quarter of last year. Similarly, prices were way up for the quarter, with meaningful appreciation for the rolling year. The condo market is in great shape right now. Going forward, we still believe that the Dutchess market will have a strong summer. 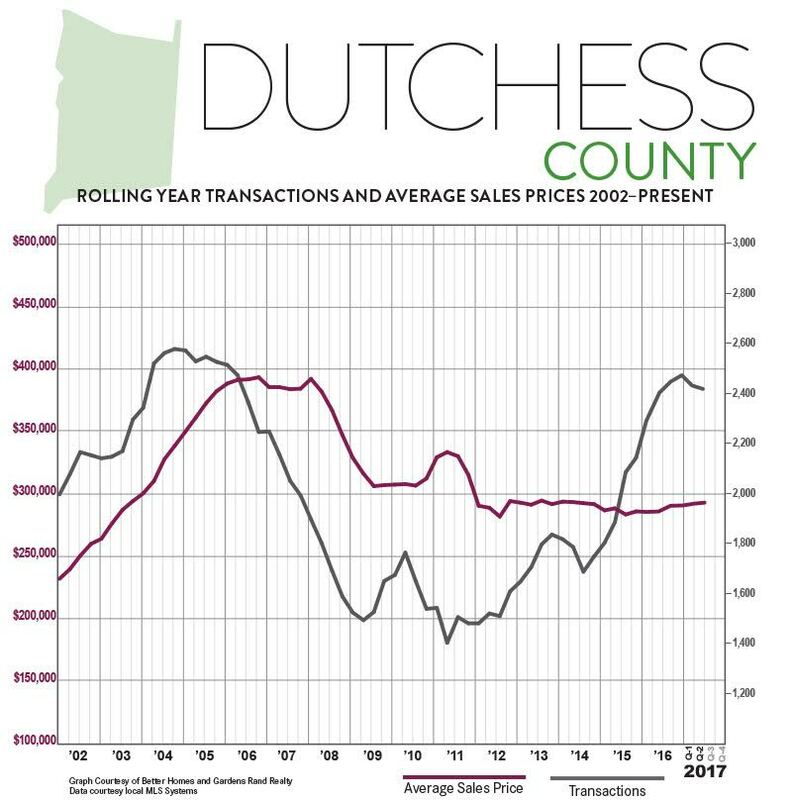 With tightening inventory, a stable economy, near-historically-low interest rates, and homes still priced at appealing 2003-04 levels, Dutchess is likely to see meaningful price appreciation through the end of the year. The Putnam County housing market showed the clear signs of constricted inventory levels, with a slowdown in sales coupled with a spike in pricing. Sales. Putnam single-family home sales were down over 12% for the quarter, the second straight quarter of a significant decline in transactions. After over five years of steadily increasing sales, Putnam is now seeing the impact of a lack of inventory, with sales now flat for the rolling year. Prices. The lack of inventory is also having its impact on pricing, which was up across the board: rising over 6% on average, almost 10% at the median, and almost 2% in the price-per-square foot. For the year, the pricing results are more mixed, with the average down just a tick, the median up a tick, and the price-per-square-foot flat. 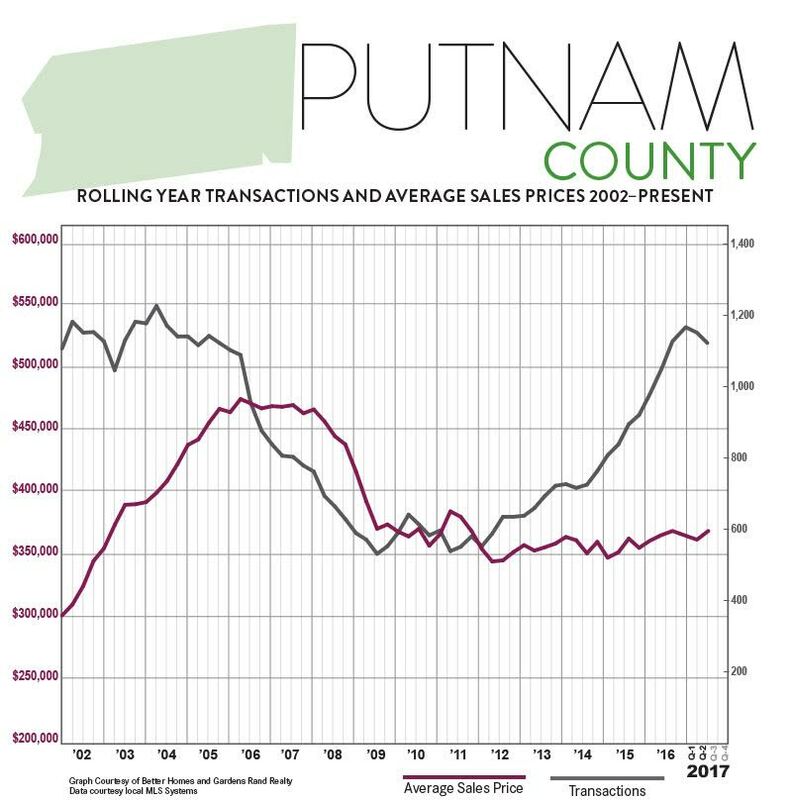 We have been expecting meaningful appreciation in Putnam for some time now, and still believe that low levels of inventory and stable demand will continue to drive prices up this year. Inventory. Inventory continued to tighten, falling 23% and now down to the six-month level that usually denotes a tightening seller’s market. This lack of available homes is what’s been restricting sales, since we don’t have enough “fuel for the fire” to keep the market going. But it’s also driving prices up, as buyers chase and compete for the limited inventory that’s available. Negotiability. The negotiability indicators support the idea that a seller’s market is emerging, with the listing retention rate up just a tick and the days-on-market continuing to fall. This is exactly what we would expect in a strengthening seller’s market — homes selling more quickly and for closer to the asking price. Condos. The impact of low inventory on the condo market was even more severe, with sales down almost 18%. In this case, though, prices also fell, dropping over 10% on average and over 13% in the median. The Putnam condo market is very thin, though, with only a few dozen sales, so we try not to read too much into one quarter’s worth of data. Going forward, we believe that Putnam is poised for a strong 2017, especially if some new inventory comes onto the market to satiate the available demand. The fundamentals of the market are tremendous: inventory is low, rates are near historic lows, and prices are still at attractive 2004-05 levels. 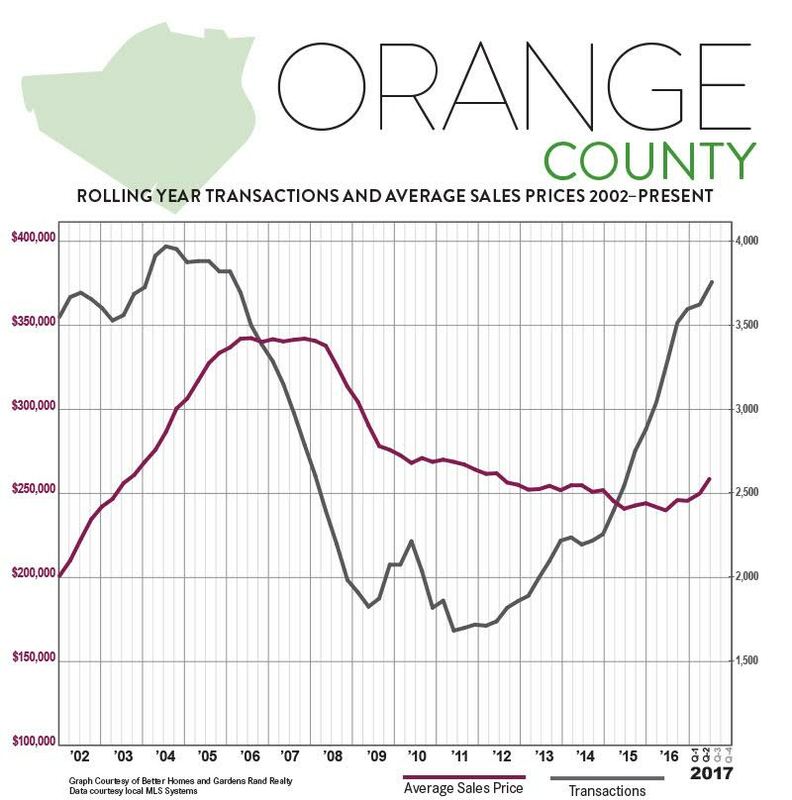 The Orange County housing market surged again in the second quarter of 2017, with both sales and prices up sharply while inventory continued to fall. Sales. Orange sales were up yet again, rising over 6% from last year’s second quarter. Quarterly transactions have now gone up in 11 straight quarters and 20 out of the last 21. Indeed, for the rolling year, sales were up almost 13%, and the 3,655 single-family sales were the highest total we have seen since the second quarter of 2006 — at the height of the last seller’s market. Prices. These sustained levels of buyer demand are finally having their expected impact on pricing. Home prices surged again in the second quarter, rising 9% on average, almost 7% at the median, and over 5% in the price-per-square foot. And home prices are now showing meaningful signs of appreciation over the longer-term, with the rolling year prices up over 5% on average, 4% at the median, and 3% in the price-per-square foot. Negotiability. The available inventory continues to tighten, with the months of inventory falling almost 25% and now down close to the six-month level that usually indicates a seller’s market. Meanwhile, homes are selling more quickly and for closer to the asking price, with the days-on-market falling and the listing retention rate rising. Condominiums. The condo market was also up sharply, continuing a welcome trend that we finally saw in the first quarter. Sales were up almost 27%, and prices were up sharply. We wouldn’t read too much into the eye-popping quarterly results, but even the rolling year totals were impressive: up 4% on average, over 2% at the median, and over 4% in the price-per-square foot. Going forward, we believe that the Orange County housing market is poised for a strong summer. The fundamentals are tremendous: demand is high, prices are still at attractive 2003-04 levels, interest rates are at historic lows, and the economy is generally strong. With inventory continuing to decline, we expect to see meaningful price appreciation through the rest of 2017. 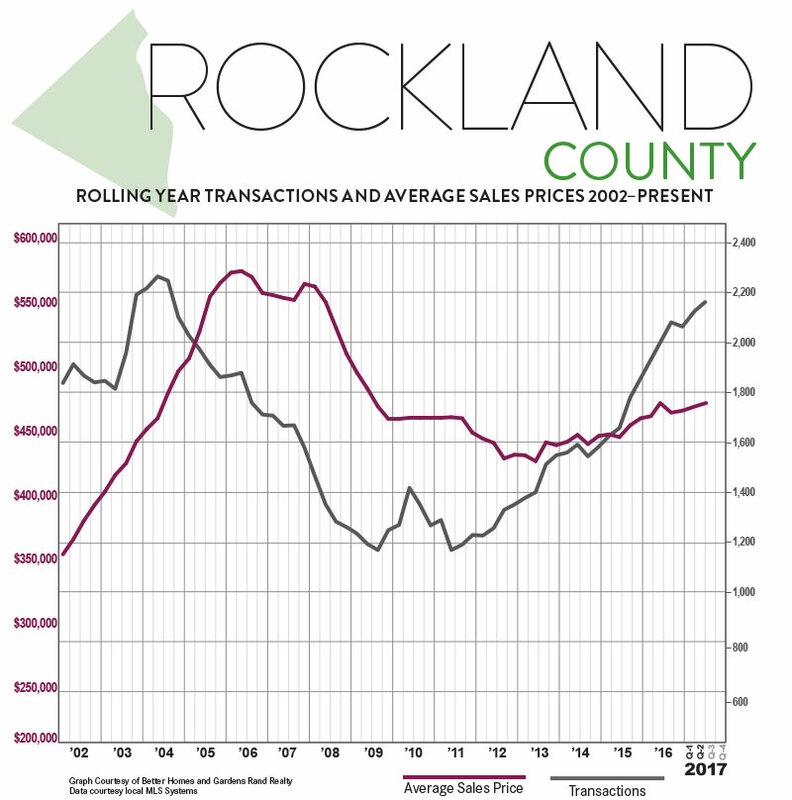 The Rockland County housing market cooled down a little in the second quarter, with transactions and prices up only slightly after a sizzling start to the year, as the lack of inventory continues to stifle sales growth. Sales. After spiking almost 24% in the first quarter, sales cooled down in the second, rising a little over 4% from last year. But this did continue a trend we’ve been watching for almost three years, the tenth time out of the last 11 quarters that year-on-year sales have gone up. Indeed, the 2,154 sales over the past rolling year marked the highest 12-month total since the third quarter of 2004. Prices. These sustained increases in buyer demand are starting to have a tangible impact on pricing. Home prices were up for the quarter across the board, rising over 1% on average, almost 3% at the median, and over 1% in the price-per-square foot. And we are seeing meaningful and sustainable price appreciation over the longer term, with the rolling year median price and price-per-square-foot up over 2%. Similarly, Rockland’s average is now up over 11% from the bottom of the market in 2012. Negotiability. Inventory continued to fall in the second quarter, depriving Rockland of the “fuel for the fire” that would drive more sales growth. The months of inventory fell almost 19%, and is now consistently at that six-month level market that denotes a seller’s market. Similarly, the listing retention rate rose and the days-on-market fell sharply, indicating that sellers are gaining negotiating leverage with buyers. Condos. The Rockland condo market absolutely surged in the second quarter, with sales up almost 36% and prices up almost 7% on average 4% at the median. For the year, sales are up over 32%, and prices are showing the first signs of life in years. With inventory falling almost 40%, and now down to well below six months, we expect that prices will continue to rise. Going forward, we expect that Rockland will have a strong summer market, with prices up and sales rising as much as they can with these levels of inventory. With prices still at attractive 2004 levels, interest rates near historic lows, inventory falling, and the economy generally strengthening, we believe that sustained buyer demand will continue to drive meaningful price appreciation through the rest of 2017.